Charles (Anders) Enders, Jr. (1865-), Coin Dealer since 1882. He dealt in U. S. and foreign coins. He was a frequent advertiser in the American Journal of Numismatics, and frequent correspondent with the Chapman Brothers. His residences were from 1880-1886: 51 Sheriff Street, (near the corner of Delancey Street) New York, New York; 1887-1889 : 324 East 69th Street ; 1890: 421 West 45th Street, New York, New York. He was born in 1865 the son of a Bavarian fruit dealer Charles Anders (1842-) and his wife Catherine (1844-). 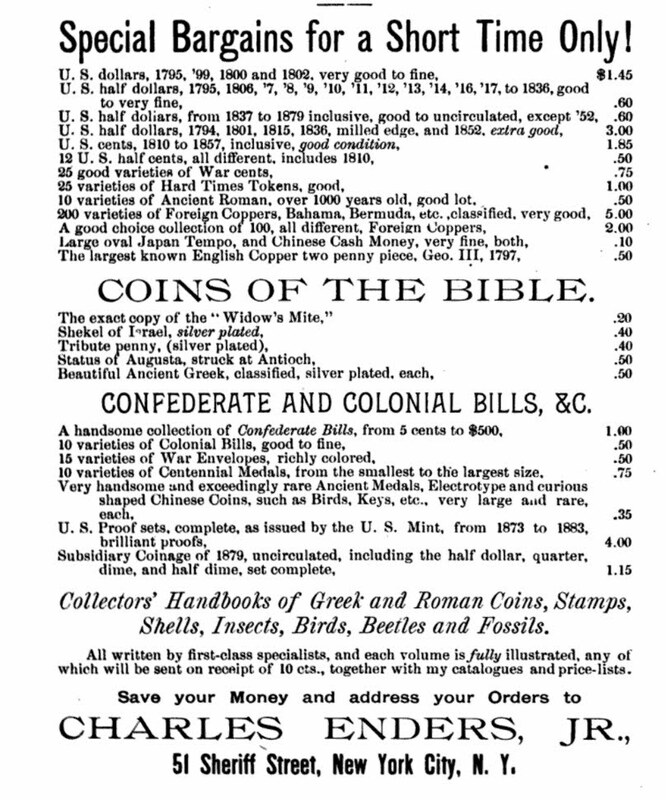 The family name was spelled Enders during the 1880's, especially by Charles, Jr.
His earliest known coin activity was bidding at the age of seventeen at the Chapman Brothers' Bushnell Sale in March 1882. At that sale he paid the Chapman Brothers in advance for a copy of the priced catalogue. In July 1882 he mailed them a postal card complaining he had not as yet received his copy reminding them he had paid them in advance. He worked as a clerk at the Louis Stoiber Men's Woolen Clothing Company, 132 Essex Street, New York, and had a coin business as a sideline. Fig. 1. 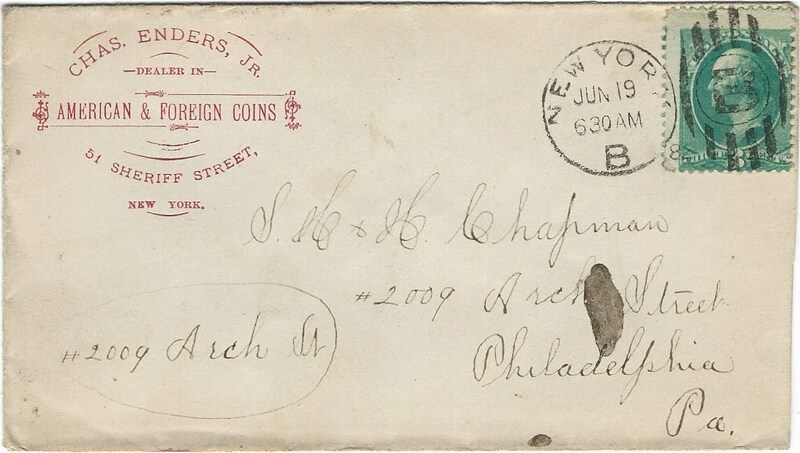 Earliest known coin dealership business envelope of Charles Enders, Jr. postmarked June 19, 1882, 6:30 PM, New York, New York, Station B, sent to the Chapman Brothers to purchase a Siege of Boston medal , Baker no. 50. Courtesy Lupia Numismatic Library, Special Collection, The Chapman Family Correspondence Archive. Fig. 2. 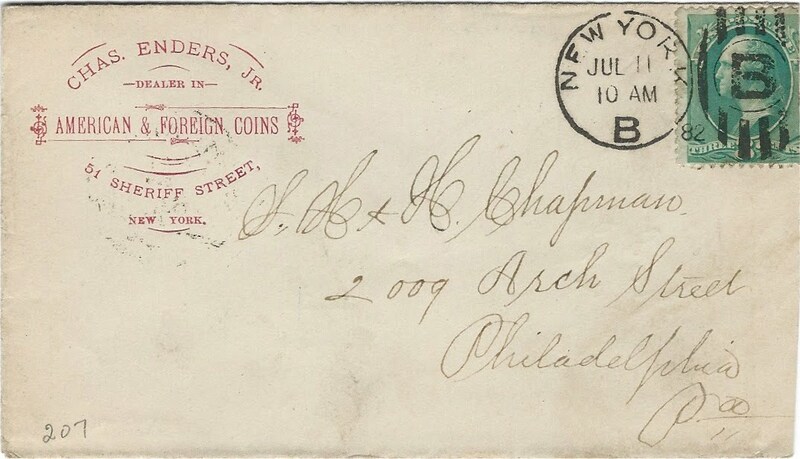 Second earliest known coin dealership business envelope of Charles Enders, Jr. postmarked June 19, 1882, 6:30 PM, New York, New York, Station B, sent to the Chapman Brothers to purchase $49.30 worth of rare coins. 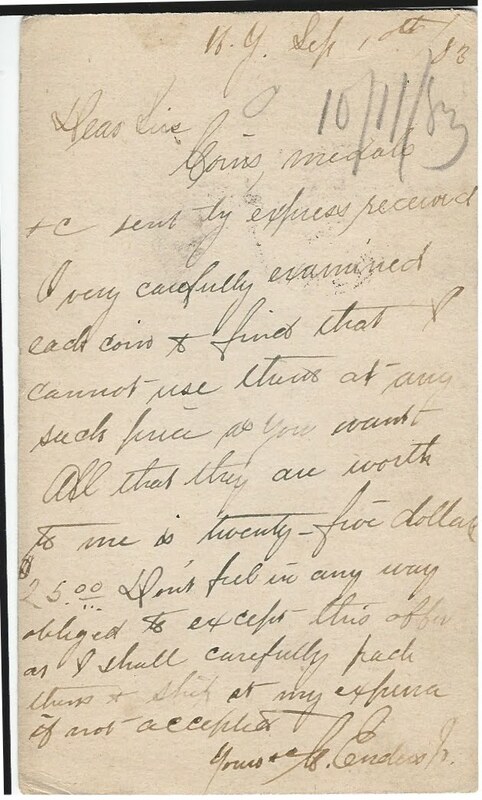 Courtesy Lupia Numismatic Library, Special Collection, The Chapman Family Correspondence Archive. Fig. 3. 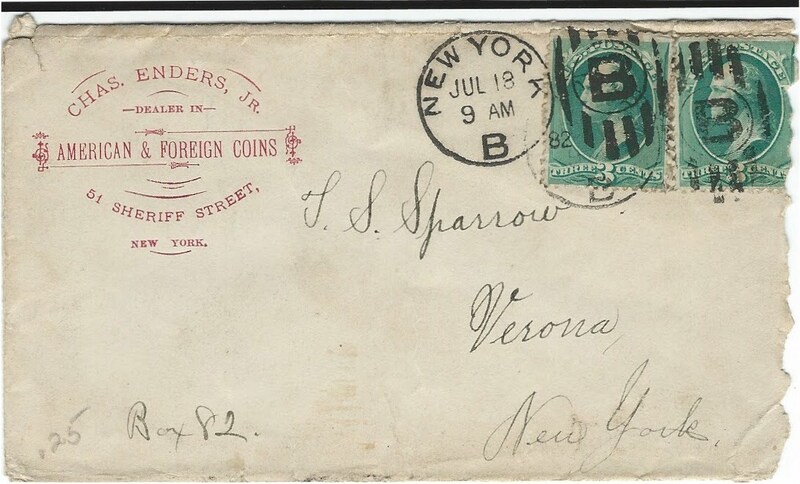 Third earliest known coin dealership business envelope of Charles Enders, Jr. postmarked July 18, 1882, sent to T. S. Sparrow, a well-known rubber stamp maker at Verona, New York who widely advertised his rubber stamps in various collectors magazines. Apparently Enders wasted no time acquiring business collateral for his coin dealership. Note postage rate of six cents for 2 ounces. Courtesy Lupia Numismatic Library, Coin Dealer Ephemera. Fig. 4. Postal Card from Enders to the Chapman Brothers postmarked July 31, 1882. 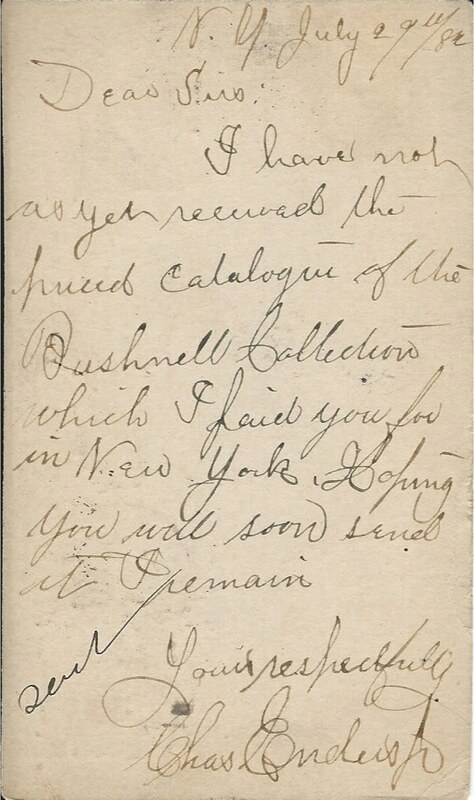 "Dear Sirs: I have not yet received the priced catalogue of the Bushnell Collection which I paid you for in New York. Hoping you will soon send it. I remain, Your respectfully, Charles Enders Jr."
Fig. 5. Postal card sent to the Chapman Brothers postmarked September 10, 1883. "Coins, medals, &c., sent by express received. I very carefully examined each coin & find that I cannot use them at any such price as you want. All that they are worth to me is twenty-five dollars $25.00 Don't feel in any way obliged to except this offer as I shall carefully pack them & ship at my expense if not accepted. Yours, 7c., C. Enders Jr." The bold young coin dealer negotiated his terms to the Chapman Brothers only to find it was declined. Fig. 6. Postal card sent to the Chapman Brothers postmarked September 12, 1883. 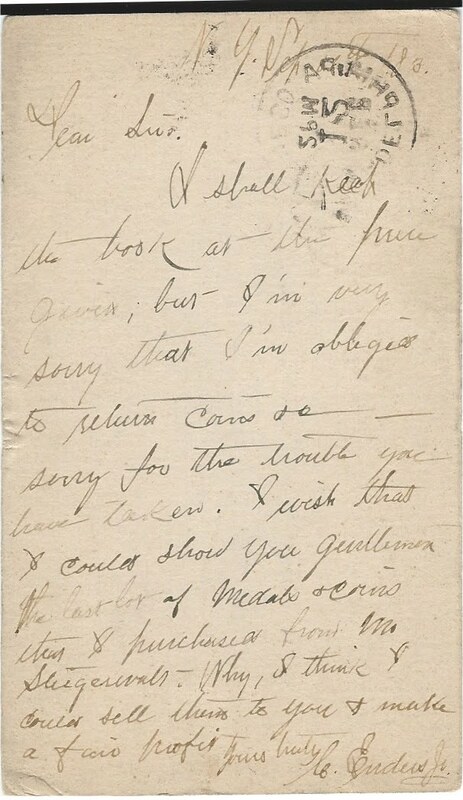 "I shall keep the book at the price given, but I'm very sorry that I am obliged to return coins &c-- sorry for the trouble you have taken. I wish that I could show you gentlemen the last lot of medals & coins that I purchased from Mr. Steigerwalt. Why, I think I could sell them to you and make a fair profit. Your truly, C Enders Jr" Enders took an awkward and bitter manner of telling a fellow dealer that he thinks their prices too high -- revealing his anger and frustration of not getting his way. Fig. 7. Postal card sent to the Chapman Brothers postmarked September 19, 1883. 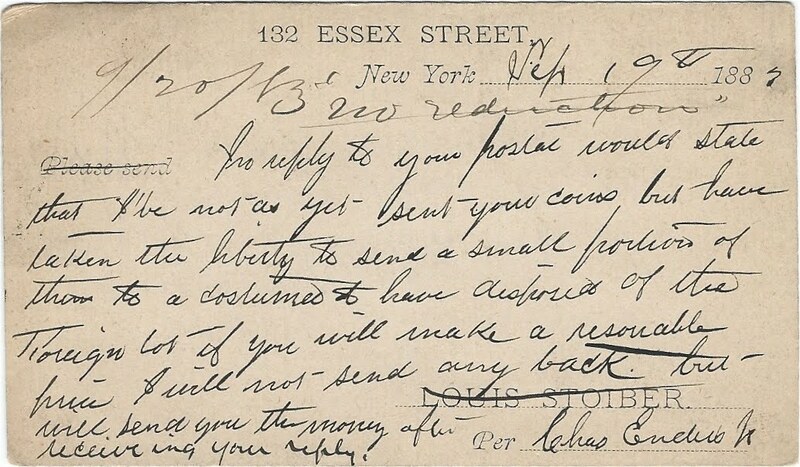 "In reply to your postal would state that I've not as yet sent you coins but have taken the liberty to send a small portion of them to a customer. I have disposed of the Foreign lot if you will make a reasonable price. I will not send any back but will send you the money after receiving your reply." An ambitious finagler Enders never sent back the coins & medals as promised in his September 10th postal card. Instead he divided the coins and medals, as he says, sending them on to his customers who agreed to buy them. Fig. 9. Advertisement in the June 1885 issue of Agassiz Journal for Curiosity Collectors . Note he sells items typical of the classic curiosity cabinet including natural and artificial history items such as insects, birds, shells, fossils, stamps, coins, Indian relics, etc. The exact replica of the Widow's Mite is an electrotype. Enders sold many electrotype copies of various U. S. and Colonial coins in the 1880's. In July 1885, in order to gain free publicity he donated an electrotype of the Confederate Half Dollar to the Editor of Queries. Fig. 10. Advertisement in the Brooklyn Magazine, July 1886. He sold a complete set of U. S. Silver Dollars 1795-1803 VG - F condition for only $14.50. NOT BAD! Fig. 11. 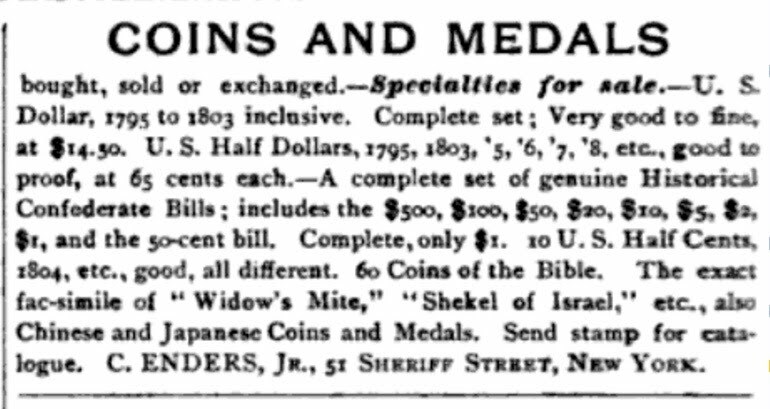 Advertisement in the American Journal of Numismatics, April 1887, with his new address 324 East 69th Street, New York, New York. Fig. 12. 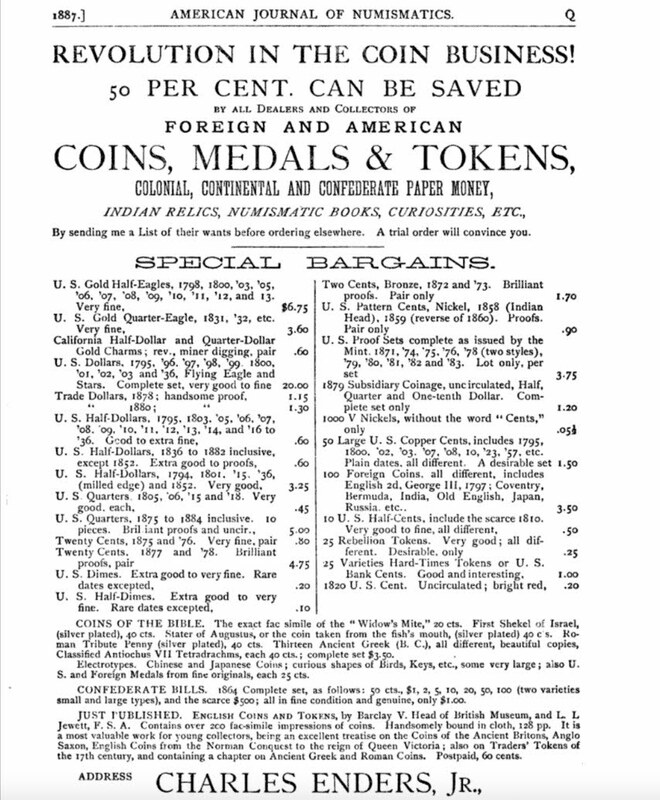 Advertisement in the American Journal of Numismatics, 1890, with his new address 421 West 45th Street, New York, New York. The Hermes International Journal of Philately and Numismatics, August (1885) : 6, column 1, bas de page.